Hello everyone, and welcome to the 13th issue of Flash! On behalf of the editorial team I would like to thank you all for your submissions and your continued support, even in the face of Week 20 deadlines. It was lovely to receive such a variety of submissions, some even being sent in from overseas! We hope you enjoyed attending the final Launch Party of the term; it was lovely being able to catch up and unwind with you all before the Lent vacation. 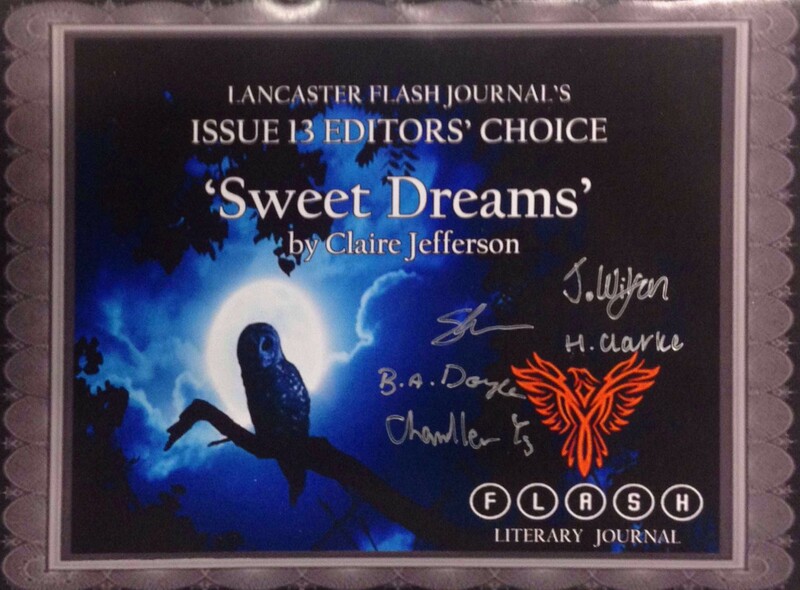 The Editor’s Choice for this issue is Claire Jefferson’s poem Sweet Dreams. Although Claire is currently studying away from Lancaster, she can still expect to receive her framed and signed certificate in the post soon! Congratulations Claire, and thank you to all our other writers who brightened the end of our term. We would also like to thank so many people for the success of our very first event this year: The Uncanny. Without the support of our guests, our speakers Jenn Ashworth and Dr. Catherine Spooner, and our open mic participants Neil James and Siobhan Diston, the night would not have been as successful as it was. An extra special thanks to Jacob Lawton who provided great live music for event too and really gave it that authentic touch. We hope you all enjoyed yourselves, as the Committee certainly did. Keep your eyes peeled for our next event being held next term. From all of us at Flash, thank you so much for your submissions and your support. We hope you enjoy your well-earned vacation, and we wish you all the best for the final term. by Claire Jefferson, with commentary from Becca Parkinson. by Sam Heslop-George, with commentary from Chandler Yang. by Walker Zupp, with commentary from Becca Parkinson. by Rebecca Freeman, with commentary from Hannah Clarke. by Jessie Carbutt, with commentary from Betty Doyle. by Cristina Marongiu, with commentary from Betty Doyle. Thank you Becca, for your lovely commentary and thank you also to who ever provided the art work; it looks great. I’m looking forward to reading everyone else’s work. Thanks for your comment; we only just received it for some reason. We hope that your artwork got to you in tact!